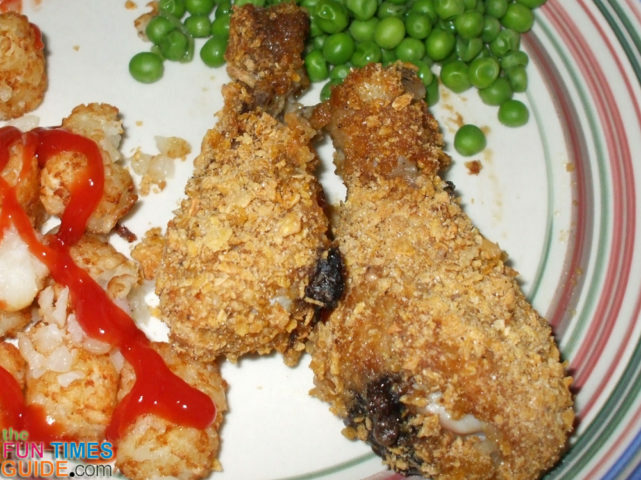 Healthy Fried Chicken Recipe: It’s SO Easy To Have Crispy Chicken… Without All The Fat! Is there anything better than finger licking good, crunchy and spicy fried chicken? All over the country — especially below the Mason Dixon line — a huge platter of crispy fried chicken and all the fixins has brought many a family together for some serious eating! Today’s wise family realizes that as good tasting as fried chicken might be, it may not be the most healthy thing for us. But doggone it, fried chicken is just plain good stuff. As hard as it is to give up Grandma’s fried chicken recipe, I figured there had to be a healthier way to enjoy crunchy chicken. So I set out to find a suitable replacement for deep fried battered goodness. The fried chicken recipe that I came up with leaves the deep fryer in the cupboard. It also eliminates most of the fat by removing the skin from the chicken pieces. This recipe is very simple and takes only a matter of minutes in preparation to create crunchy, crispy chicken that can be passed off as fried — even though it’s baked and is considerably healthier. This recipe can be easily adjusted to accommodate any quantity of chicken. I usually cook this for just my wife and I, so our quantities are relatively small. We normally eat legs and thighs since they can be purchased in bulk quantity at a more reasonable price, and the size of the pieces suits our appetite. Quantities may seem vague, but measurements are not critical and it’s easy to judge that you have enough. If you like a little kick, you might wish to add some paprika, or even some crushed red pepper to the mix. With the zip lock bag closed, crush the Corn Flakes with a rolling pin to the consistency of small particles (but not to the point of power). Add salt and pepper to the zip lock bag. One piece at a time, dredge the chicken through the egg and place inside the zip lock bag. With the bag closed, shake until the chicken is well-coated. Remove the chicken piece and place on a baking sheet. Continue steps 1-5 until all chicken is prepared. Place baking sheet with chicken in a 350° oven for at least 1 hour, until golden brown and crispy and meat is thoroughly cooked. This is an ideal recipe for the small apartment dweller as it cooks up quite nicely in a toaster oven. If you’re like me, one meal just isn’t enough of a good thing. I make enough to have leftovers the next day and just pop them back into the toaster oven to reheat. I always enjoy a second meal of finger licking good crunchy chicken. There’s no need to feel guilty. 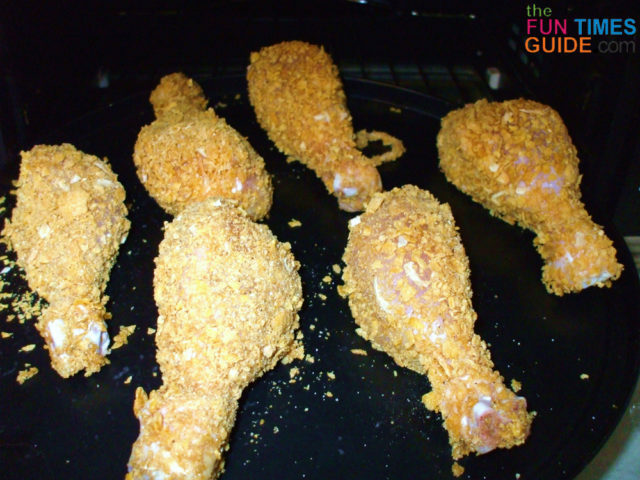 Being baked and having the chicken skin removed makes this fried chicken recipe much healthier than most. With this recipe, you have a good healthy high protein meal that tastes so good it shouldn’t be as healthy as it is!